With installation of commemorative bricks at the National Museum of the United States Army (NMUSA) in full swing, more and more brick purchasers are choosing to share the story behind their bricks. 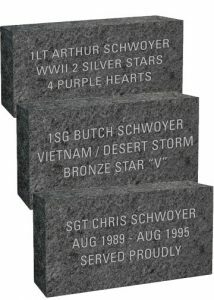 Butch Schwoyer recently relayed the story behind his three bricks, purchased for himself, his father, and his son. Schwoyer served in Vietnam and Desert Storm and retired as a First Sergeant in 1992. In recalling his service, Schwoyer said, “I had the privilege of serving and fighting next to the most patriotic and dedicated men and women I have ever met. I would do it all over again if I had the chance.” He originally purchased a brick for himself to commemorate that transformative time in his life. 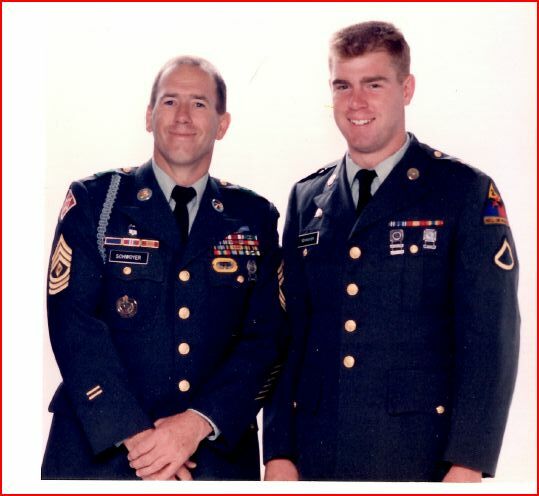 When his former company commander, Colonel Darcy Brewer (USA-Ret. ), NMUSA Senior Project Manager, Huffman Developments, personally presented him with his brick certificate, he and his wife were inspired to purchase two more bricks for Schwoyer’s father, Arthur, now deceased, and their son, Chris. First Lieutenant Arthur Schwoyer served in World War II and received two Silver Stars, four Purple Hearts, a Bronze Star, among other awards. Sergeant Chris Schwoyer served from 1989-1995 and was stationed at Fort Hood, Texas; Baumholder, Germany and Fort Lewis, Wash.
To share your own “Why My Brick” story visit armyhistory.org/bricks. Post a picture of your brick on social media with #myarmybrick and we’ll share your post!